This one-pot chicken dish is sweet from the shallots and bursting with the comforting richness of meat cooked in wine and butter. Serve with new potatoes and greens for an easy Sunday lunch. Remove the chicken from the fridge 30 minutes before cooking to take off the chill. Heat the oven to 200°C/180°C fan/gas 6. Heat the butter and oil in the casserole over a low-medium heat. Add the shallots and fennel seeds and cook, stirring, until they start to colour. Add the herbs and chopped fennel and cook for 10 minutes. Add the chicken and the wine and bubble for 5 minutes, then pour in the chicken stock (it should come halfway up the chicken). Bring to the boil, then cover with the lid and cook in the oven for 1 hour. After 1 hour, remove the lid, drizzle the chicken skin with olive oil, grind over some black pepper and sprinkle over a little flaked salt. Cook for a further 30 minutes, uncovered, until the skin is golden. Remove the chicken and leave to rest on a carving board. Season the fennel and shallot broth to taste. 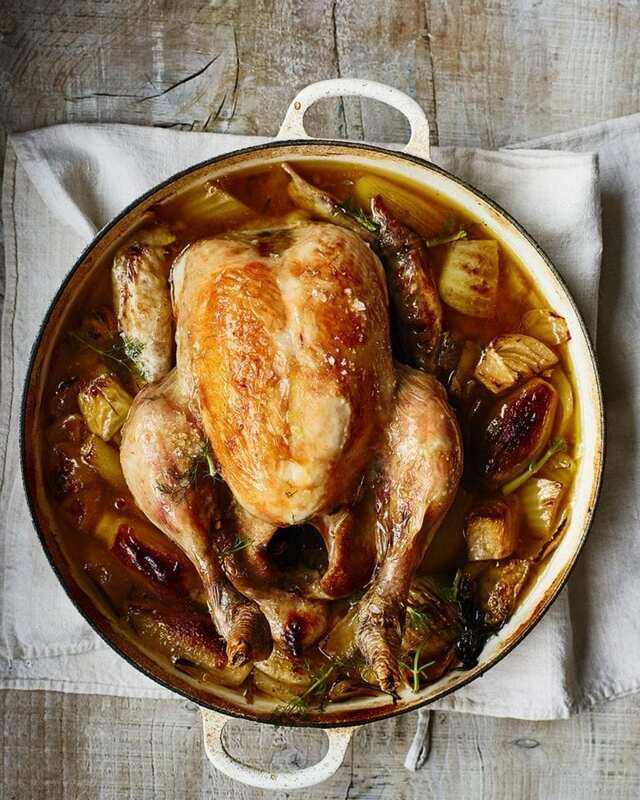 Carve the bird and serve in shallow bowls with the broth spooned over and scattered with fennel fronds. This is excellent served with dollops of garlicky aïoli and a warmed baguette. To make a quick aïoli, stir crushed garlic into good quality shop-bought mayonnaise and season to taste.